Compost sifters are extremely helpful for breaking up compost to use in gardening and potting plants. You can build a compost sifter in as little as a few hours with just a few tools and materials. Use the following plans to build a simple, handheld or standable sifter that can become a value tool for your garden. Compost sifters are extremely simple devices, both to use and to build. To determine the size of the sifter you want to build, consider how you will be using it. Tilted at an angle against a building; the compost is poured on top and the smaller particles simply go through the screen. Take the material you want from the bottom and toss what's left back into the compost bin. Held over a wheelbarrow or other container. Use your body to twist and shake the sifter back and forth until it breaks down and shakes apart the smaller pieces of compost through the screen. Return the excess material that did not breakdown into the compost heap. Obviously, if you choose to hold the sifter, you need to build it in proportions that are easy enough to hold and work with. If you plan on leaning it against a building or other support, then build it so that it will cover the entire container, bin or different compost heap you wish the sifted compost to fill. Cut two of the boards so they are approximately 1-inch shorter in length than the roll of mesh. Cut the third board in half so you have two pieces of the same length. Nail the four boards together to form a rectangle, with the longer boards overlapping the shorter ones at the ends. Staple the 1/2-inch mesh to one, long side of the sifter and pull it tightly across to the other side. Staple the corners on the opposite side and stretch the mesh lengthwise. Staple it down on the shorter ends, then complete stapling it across the final, long end until it is taut. 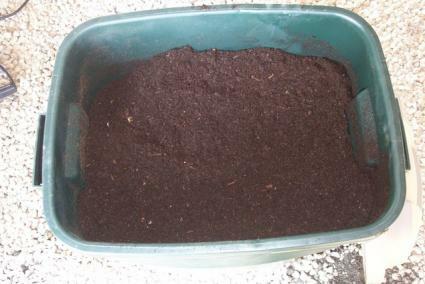 If you need a sifter with a deep basin to create fine, potting soil grade compost, consider building this deep-box sifter with nylon rope handles. The advantage of this sifter is that you can pile more compost into this design for larger quantities of fine compost. If you need to filter out large particles, such as rocks and stones, a trommel style sifter is beneficial. Check out these plans for building one. Position your sifter at either a 45-degree angle against a building for support and over a collection container or area. You may prefer to place it directly over a wheelbarrow or other container. If desired, build two or three sifters, each with a different sized mesh. You can filter your compost into finer and finer grades for use with potting household plants or other more delicate plantings. Making a compost sifter is also be a great project to build with your children. The project presents an ideal way to teach youngsters a few basic woodworking skills, as well as involve them in the composting process to encourage a lifelong interest in green living.